In 1920s and 1930s Ireland, whiskey was sold in casks from the distillery to wholesalers, who would in turn sell it on to publicans. Cork Distilleries Company was very proud of the strong reputation which its whiskey had earned and wanted to prevent any fluctuation in whiskey quality due to bonder underhandedly diluting the casks. Thus the company was one of the first to bottle their whiskey, which became known as Paddy. 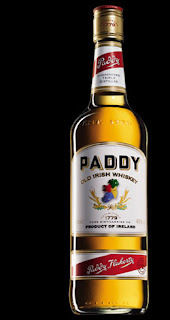 During maturation in oak casks stored in dark aromatic warehouses for up to seven years, Paddy whiskey mellows, and takes on it's distinctive rich, golden colour. Two percent of Paddy Whiskey is lost to the atmosphere during maturation. This evaporated whiskey has come to be called 'The Angel's Share'. Fresh and lively, aromatic - a complex interplay of nutty maltiness, woodland fragrances and spice, with hints of honey and vanilla. Mild, soft, a distinctive mellow maltiness, a touch of sweet oil, spiciness - and again those background notes of honey, vanilla, toasted wood. A sweetness gently fading, mellow maltiness and mild woody notes lingering pleasingly.